Are you running short of storage on your Mac and looking for the best portable hard drive for Mac? It's not strange that you might be short of memory and will be in need of extra external drives for Mac, since you do everything on Mac OS, from playing games, watching movies, listening to music to doing all types official jobs. Furthermore, you might need an extra space to storage massive media files, such as DVD discs; you might just want an Apple USB disk drive to free up space on Mac for faster running speed; Or even your Mac computer calls for an external hard drive simply for setting up a backup. 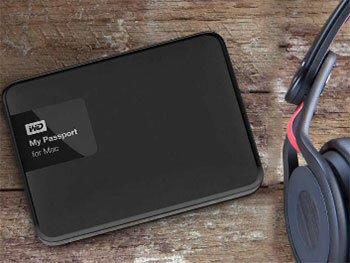 Whatever the reason, picking up a portable drive for Mac is absolutely a significant but never easy option. We're discussing the best portable external hard drive for Mac to help you out in going in the right decision so as to increase your Mac storage and build a digital DVD library. MacX DVD Ripper Pro, a reliable DVD ripper to convert DVD to MP4, MOV, AVI, MKV digital formats so that you can save your DVD collections to portable external hard drives and build a digital DVD library. There are so many portable external DVD drives for Mac to expand the memory on the market, from USB type C, SD card, Chromecast to network-attached storage (NAS). But the huge options makes Mac users perplexed to decide what to get and what not. 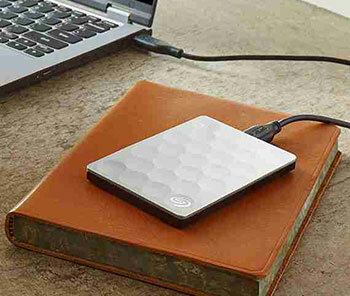 To make your choice much easier, here listed the best portable hard drive for Mac. USB 3.0 interface. Offers an easy-to-use connection to devices. Backward compatible with USB 2.0 for simple connection to your computer. Data transfer rates up to 5 Gbps with USB 3.0. Enable a rapid response when updating files. Password protection and 256-bit AES hardware encryption. Help keep your files secure. Time Machine compatible. Back up your entire system directly to the drive. Automatic back-up software. Safeguards your data. Compatible with PC and Mac. For flexible installation options. USB 3.0/2.0 interface. Makes it easy to connect your computer. Seagate Dashboard software. Allows local, mobile, Cloud and social media backup. Also lets you run a 1-click backup or schedule regular automatic backups. Seagate Mobile Backup app (download required). Lets you back up pictures and videos stored on your compatible Apple® iOS or Android device. Compatible with PC and Mac. For flexible use. 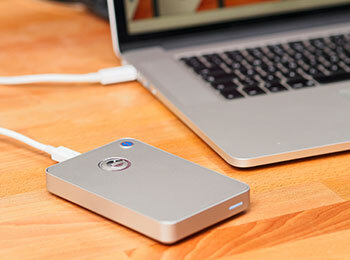 Includes Seagate Backup Plus portable drive NTFS driver for Mac. 4TB storage capacity. Provides ample space for music, movies, photos, games and other digital data. USB 3.0 interface. For a simple connection to your computer. Backward compatible with USB 2.0. Data transfer rates up to 165MB/sec. Ensure a rapid response when updating files. 7200 rpm speed. For fast performance. Compact, all-aluminum enclosure. 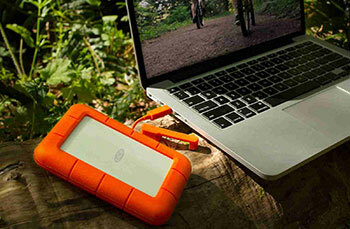 Offers durability, making it easy to take your media on the go. Compatible with Mac and PC (reformatting required). To accommodate your storage needs. Also compatible with Apple® Time Machine. 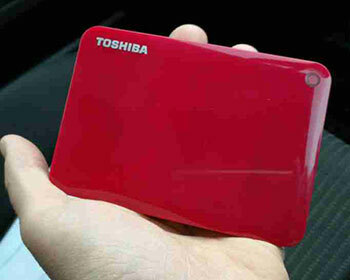 1TB storage capacity. Offers ample room for photos, videos, music and more. USB 3.0/2.0 interface. Ensures a fast, reliable connection. Data transfer rates up to 4.8 Gbps. For efficient operation. Password protection. Makes sure that your files are guarded against intrusions. Rubber sleeve and shock-resistant design. Keep your data safe from external forces. 2.5TB storage capacity. Provides ample room for your media collection. USB 3.0 interface. Allows one-connection setup and intuitive use. USB powered. Data transfer rates up to 5 Gbps. Ensure that info is transferred quickly, so you aren't left waiting. Automatic backups. Make certain that your digital files are protected. Password-protected data encryption keeps your backups secure. Pocket-size design. Offers easy portability. Compatible with Mac or PC. Lets you store and access files without reformatting. You see, the above mentioned portable hard drives for Mac achieve a lot not only on portability, design, but also the speed, connectivity, iOS compatibility, and Apple's AirPort Time capsules. You can take full advantages of the best Apple USB disk drives to do everything, such as transfer DVD to hard drive, make a backup of Mac computer etc. However, it is undeniable that these Mac external drives cost a lot. If you don't plan to spend a lot money on them, you can use your iPad iPhone as a hard drive only if you download MacX MediaTrans on your Mac computer. Of course, it only applies to small size media files. Yeah, ripping DVD to digital formats and storing them to portable hard drives for Mac are quite common for DVD collectors, especially when DVD is gradually replaced by digital copies for streaming. People would like to copy DVD to external drive, USB, SD card, NAS, media server etc. to build a digital DVD library. 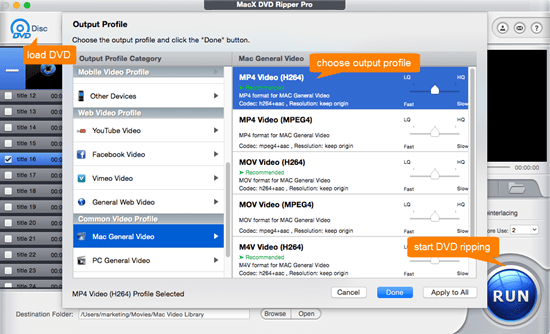 To do that, MacX DVD Ripper Pro works like a charm, allowing you to easily convert DVD to MP4, FLV, AVI, WMV, MOV, MPEG to hard drive with high video quality, including the latest new DVD releases, 99-title DVDs, TV series DVDs, workout DVDs, and other damaged or unplayable DVDs etc. How to Rip DVD to External Hard Drive for Mac? Step 1: Import DVD. Free download the DVD ripper and launch it. Insert your DVD disc and load it by drag and drop or click on "DVD Disc" icon. If you're running on a Windows PC, grab the Windows edition to load DVD with the same action. Step 2: Choose output format. For those who want to copy DVD to hard drive on Mac, you can simply 1:1 copy DVD to ISO image, MKV, MPEG2 without any loss; if you want to convert DVD to NAS, portable disk drive on Mac, you can choose any widely used format like MP4, AVI, MOV, MPEG etc. Step 3: Specify Portable Hard Drive as Output Folder. Click "Browse" button to select your plug-in portable drive as output folder path to save your copied DVD. Step 4: Convert DVD to External Hard Drive. Click on "RUN" button, and your DVD disc will be converted to Mac external disk drives without any 3rd party helps. The software developer calls for copying or ripping DVD to hard drive on Mac and Windows under the concept of Fair Use and does not encourage any illegal reproduction or distribution of copyrighted content. Please abide by the local DVD copyright law before doing it. MacX DVD Ripper Pro - professional DVD ripper to rip and copy DVD to portable external hard drive for Mac with MP4, MOV, MKV, AVI, FLV, VOB, MPEG-2 and more with 98% quality Kept. 5 Mins to rip a full DVD to portable hard drive if your hardware configurations are high-end enough! MacX DVD Ripper - Rip DVD to Portable Hard Drive in 5 Mins!